IC is dangerous because Gbagbo continues to deny results of the presidential elections in which opposition candidate Alassane Ouattara was elected. 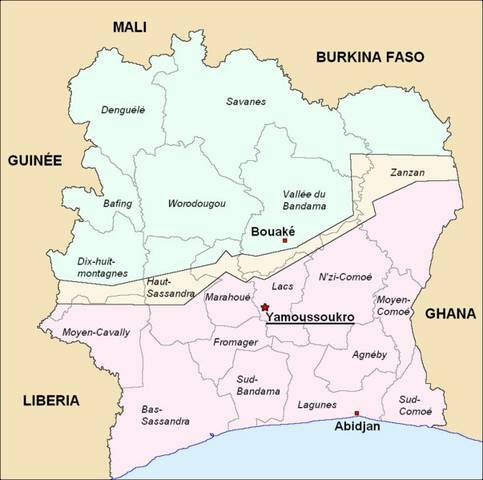 I entered Cote d'Ivoire, commonly called Ivory Coast by the Anglophone world. This is a country htat uses French as their business language. After many weeks of observation it appeared to me the country was at an impasse, the situation was a stalemate. The Ivory Coast military was protecting Gbagbo from Alassane, and the United Nations was protecting Alassane from Gbagbo. "Gbagbo continues to deny the results of the presidential elections that took place last year in which opposition candidate Alassane Ouattara was elected as president. The polls were ratified and certified by a UN envoy. Ouattara has been recognized by the international community as the duly elected president but Gbagbo refuses to step down. UNOCI has also warned that Gbagbo loyalist militias may be preparing for civil war." My Prediction of the Future: I came to the decision, this stalemate would exist for a year or two, then providing neither leader died, they would agree to power sharing of what is more or less a country ran by dictators preteinding to be Presidents. I am living with a girlfiend, with plans to apply for a Visa to Ghana first, which would allow me a quick escape by land. I will then apply for a Liberia Visa with the hope I can make an overland trip. Today is February 23, 2011, I have only been in the country for a week. The problems are complicated, one village could be an Alasane support area, and less than 10 minutes away the next village would support Gbagbo. The Islamic group supports Alassane, while the Christians normally support Gbagbo, this means within a village, it can be neighbor against neighbor. Everyone is looking over their shoulder, wondering who is safe and who is a spy, who could become the enemy tomorrow?